Look around any modern-day office and you’ll see people in every direction who are hunched over their computer keyboards. Ask any chiropractor, massage therapist, physical therapist, acupuncturist, orthopedist, or internist how many patients a week they see with symptoms related to “computer hunch”—it’s positively staggering. Now take poor habits of working on the computer for hours on end—poor keyboard placement, incorrectly sized and positioned monitors, and so on—and have the user start walking while working with these same improper ergonomics. Soon, the carpal tunnels in their wrists and forearms constrict even more as their hands anchor to the desk to counteract the sway of walking. Reaching for a keyboard, now even further away from their bodies, causes their shoulders to round out even more, increasing the strain on the muscles in their neck and shoulders. Part of the solution is to use a properly positioned and sized monitor while you are working. Ergonomic keyboard and mouse accessories are also crucial to help relieve and prevent muscle pain and strain. Typing while on a treadmill desk is a wholly different experience than typing while sitting at a desk. With no arm rests to support the weight of the arms, the gentle swaying motions caused by walking makes it practically impossible to type without anchoring your palms somewhere in front of the keyboard. Precise mouse manipulation is also more difficult when the body is swaying, which is why some treadmill desk users prefer to use trackballs so they can anchor their hands to the trackball base and use a finger or two to move the cursor. The genius of the QWERTY keyboard was its optimization for speed and accuracy in typing given the mechanical limitations of typewriters of that time. What its century-old design failed to address (“ergonomics” probably wasn’t a word found in a dictionary in 1878) was requiring the typist to place her hands so close together causes them to pronate. This constricts the carpal tunnel, and can result in entrapment of the median nerve. 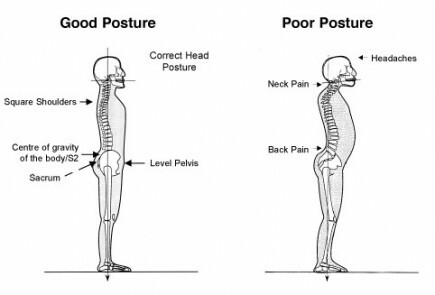 It also causes the upper body to “round out,” causing misalignment of the neck and shoulders. When walking on a treadmill the user tends to put a little more distance between herself and the keyboard, increasing postural rounding and strain on her neck and shoulders even more. Lastly, most computer keyboards have small snap-out tabs to raise the back edge of the keyboard. Unfortunately this is completely backwards from the proper ergonomic position. The proper keyboard angle would actually be to raise the front edge of the keyboard significantly higher than the back, especially when the body is further away from the front of the keyboard as it is when walking on a treadmill desk. That negative tilt angle could be anywhere from a few degrees up to 30? 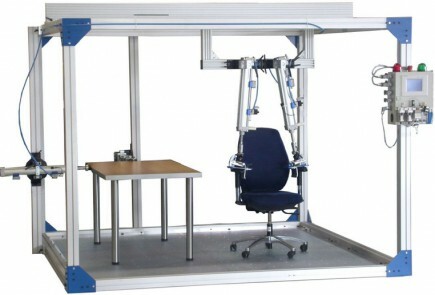 depending on the user’s mode – sitting, standing or walking – and their body type, equipment setup, etc. Some of the treadmill desks on the market and many home-built units further exacerbate these problems further by placing either the treadmill’s control console right between the user and their keyboard (e.g. the Exerpeutic), or placing a thick armrest cushion along the front edge of the desk (e.g. Steelcase) – or worse, doing both (e.g. LifeSpan, Exerpeutic). This is especially serious for users carrying a few extra pounds around the middle because it pushes the keyboard 6 inches or more further out from where it should be. The inexpensive Microsoft Natural Ergonomic Keyboard has integrated wrist pads, a numeric keypad and scroll controllers. There are several so-called “ergonomic keyboard” models on the market. Probably the best known is the Microsoft Natural Ergonomic Keyboard 4000. It’s a step up from a flat keyboard, but anyone looking for a true upgrade should check out our Editors’ Pick for treadmill desk users, the Freestyle2 ergonomic keyboard by Kinesis. The Freestyle2 is literally split down the middle. The left and right halves can be separated by up to 9 inches. This keyboard is brilliant for working while sitting, standing or walking because it allows the chest to remain open with the shoulders further back, dramatically reducing that insidious hunched-over posture. In addition, Freestyle sells an add-on kit that enables the keyboard halves to be “tented up” 5, 10 or 15 degrees, to reduce pronation and bring the wrists back to a more neutral position. In a perfect world all keyboards would be designed like the Freestyle2, but there are a few drawbacks to consider. Some people are emotionally attached to their brand of keyboard and shudder at the thought of learning to use a new layout, especially one that really requires you to be a proper touch typist. The Freestyle Keyboard also lacks a numeric keypad, so those who work a lot with numbers may not like it. Editors’ Pick: The left and right halves of the Kinesis Freestyle2 can be separated up to 9″. Lastly, at $134 (with the highly recommended VIP3 upgrade kit for “tenting” the keyboard) it’s a lot more expensive than the $20 commodity keyboard. This has to be weighed against the potential suffering, lost productivity and costs of dealing with carpal tunnel syndrome down the road. Another option for an ergonomically scrupulous treadmill desker is the Goldtouch V2 Ergonomic Keyboard from Key Ovation. These all-in-one keyboards rely on a locking ball joint for smooth, rotational adjustment. While they’re not fully separable, a la the Freestyle2, they do offer 30º of splay and another 30º of tent. Many treadmill desk users find that using a traditional mouse results in wrist pain even when sitting, much less walking. There are various trackball devices that some treadmill deskers prefer, as well as touchpads like the Logitech Touchpad, Dell Touchpad and the Apple Magic Trackpad. The Evoluent VerticalMouse helps relieve workday pressure on the the forearm and wrist. Vertical mice may look like a walk on the Escher side, but they’re actually a great addition to an ergonomic workplace. By turning a traditional mouse on its side, vertical mice also turn the standard flat palm position of a mouse user into a “handshake grip” – a much more ergonomically secure position. The switch takes some getting used to, but most adopters find that greater comfort and lessened risk of carpal tunnel syndrome are well worth the learning curve. One of our favorites here at WorkWhileWalking is the Evoluent VerticalMouse, a well-designed addition to the category. For consuming content while walking you often don’t need to touch the keyboard much, if at all. All you really need is mouse control. One very clever way to do this without having to physically tether yourself to the desktop is by using one of the many new hand-held trackball mouse or ring mouse devices. When you’re walking, you simply hold the mouse in your hand so you can swing your arms back and forth and eliminate the undue strain on your walking muscles as well as your wrist/arm/shoulder muscles and joints from being tethered to the desk. Ring mouse users should still keep a more standard option around for more intensive tasks. These handheld mice tie up one hand, and make it difficult to use a keyboard and mouse together. People who find themselves walking several miles a day for the first time in years also soon realize the large muscles in their back and legs have atrophied from too many hours spent in office chairs, airplane seats, restaurant chairs, and on sofas in front of the TV. Failing to exercise and stretch those large muscles can lead to the smaller muscles in the lower back, pelvis, and legs straining painfully under these new loads. To counteract these negative effects, treadmill deskers must stretch correctly and often and carefully pace themselves while ramping up their daily usage of the treadmill desk. In addition, using a standing mat during breaks from walking will relieve back, leg, and foot pain.